MonoVM has launched Bitcoin VPS Server to enable you to pay the costs for your servers through Bitcoin. With the 21st century, came innovation. One of the new developments is cryptocurrency, a means of exchange, independent of any authority, transferable through the world wide web in a secure and verifiable way. With its increasing popularity, more and more markets adopt the use of cryptocurrency. Virtual Private Server (VPS) is a virtual machine, which is offered to you as a service to run your Forex vps, VPN/Proxy server, hosting your website, hosting your files and more. Our Bitcoin VPS Hosting server are based on VMware ESXi hypervisors hosted on first-class hardware which is capable of hosting multiple virtual machines. You can buy vps with bitcoin(BTC), litecoin, cash bitcoin, Ethereum, XRP on MonoVM. All the following Bitcoin VPS Hosting plans, in fact all our services could be paid for using bitcoin. High quality remote desktop access and instant activation. Fast, secure, and reliable VPS service with customizable configuration. Run your private website hosting with dedicated resources. Push the performance of your VPS beyond the hardware capabilities of traditional spinning drives. We at MonoVM care about our customers and offer top-of-the-line hosting services. For your satisfaction, we include the following features with all our VPS plans. All windows VPS plans include full administrator remote desktop access with the possibility to install your own software. Our recommended OS are windows server 2008, 2008 R2 and 2012 R2. All Linux VPS plans include full root access provided with the SSH security protocol. Different versions of CentOS, Ubuntu, Debian and other Linux distributions can be provided but we always recommend using the latest stable versions. All softwares and hosting control panels can be installed on them. All VPS plans are upgradeable, therefore when more resources are needed you can easily upgrade your VPS to meet all your needs. MonoVM support team consists of software and hardware specialists who are online 24/7 waiting to help you in any way possible. We value quality above all else. MonoVM VPS servers run on high-end Intel and Supermicro processors with storage devices that are configured in RAID 10 arrays using enterprise RAID controllers with integrated SSD caching optimized by MonoVM technicians. These servers are equipped with high rpm HDDs and enterprise-grade SSDs.They are strategically located in first-class data centers around the globe in more than 10 countries which provides you the possibility to pick for your convenience. What are the uses of a VPS? A VPS has many uses which include: web hosting, keeping applications online, running VPN, web browsing etc. How long does it take to setup the VPS? All services are deployed within 15 minutes, after the payment has been processed. If that's not the case, please contact our support. What kind of cryptocurrency do you accept? Will my Windows VPS come with a control panel? Yes, by default all our Windows VPS plans come with Plesk control panel, however this could be changed upon request. What happens if I reach my bandwidth on my VPS? You cannot reach a bandwidth limit on MonoVM VPS servers because all our VPS services come with unlimited bandwidth. 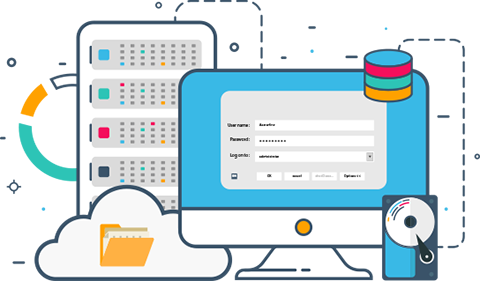 We provide full root or administrative access where you will have total control over your environment allowing you to install applications or host websites on your VPS. All of our VPS come with an unmetered bandwidth. No more extra fees and server downtime due to passing an allocated bandwidth limit. Using first class powerful hardware and RAID10 technology on our VPS servers, we assure fast and stable performance. We guarantee the 99.99% uptime by our trustful enterprise network structure and vast traffic bandwidth provided within the world class data centers. We guarantee that all VPS services will be up and running within 15 minutes. The details of activation will be sent to your email address. MonoVM VPS services are based on a stable and powerful VMware ESXi hypervisor. We provide dedicated resources and stable performance to your virtual machine. In our data centers, the internal network is based on fiber optic connections which allow for an almost zero latency. All our Linux VPS servers are managed by cPanel and DirectAdmin control panel by default. This is the industry's most widely used and well-supported Linux server control panel.